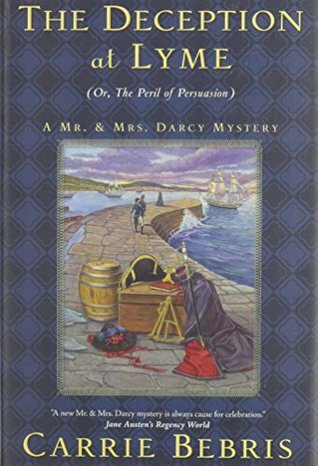 The Deception at Lyme is the sixth book in the Mr. and Mrs. Darcy Mysteries series but can be read as a stand alone, in fact it is the only one I’ve read, even if it will certainly not be the last one considering I was completely hooked with it. This book is a mashup of Pride and Prejudice and Persuasion bringing several characters from both stories together in perfect harmony. I bought it because these are my two favourite novels from Austen and am always eager to read books where these characters interact, but I was not expecting to love it so much! The Deception at Lyme is a sequel to both stories with both couples happily married, but even though it is considered a astenesque story, the tone is so different from the romances I’ve been reading in the last couple of years that I was completely surrendered to it . I can’t say I’ve read too many JAFF books because they are never too many, but when someone reads many stories which are very similar to one another, the details tend to blend in and when that starts to happen to me I crave for something new. That is precisely what I found in this book, an escape from the regular JAFF books, an encounter with the characters I love but that takes me into a completely different direction. Not only this book brings to readers characters from both Persuasion, Pride and Prejudice but it also delivers very interesting original characters and it escapes the romance. This book has all our beloved characters in it, but it is not a romance, it is a mystery. I’ve read JAFF mysteries before but they all have some romance to it, The Deception at Lyme doesn’t. Its entire focus is the mystery and it caught my attention from page one until the end. Darcy and Elizabeth are happily married and have a little baby girl but the book doesn’t focus on their relationship, it focuses on the mystery they are trying to solve and that involves the characters from Persuasion. Of course that while they are playing detective we can see how their relationship is, but that is not the focus of the author and I honestly found that refreshing. There is some romance between other characters that I enjoyed very much but it is not central in the book. As the story progresses we understand there is not only one mystery but two that need to be solved and I liked to see that they seemed to be connected. The author excelled at linking all the dots making it a believable story and even leaving some room to interpretation concerning one of the characters (I chose to believe she is guilty 😉 ). Before each chapter we have a Jane Austen quote that will somehow be related to the events of the following chapter, and I found myself eager to know which was the next quote the author was going to use because that would give me a hint on what to expect. It may seem a small detail, but I think it brought more quality to the book. The Deception at Lyme is exciting from the beginning until the end and having Darcy and Elizabeth along with Captain Wentworth and Anne in the same book was magical, especially because I felt the characters remained very true to themselves despite their uncommon interactions. What a delightful review. I too like to see something different in our JAFF but still want D&E to be themselves. I have never seen this series before and will put them on my wish-list. What fun. My TBR pile is out of control… so I will need to wait a while before I throw on another book. Thanks for sharing Rita. Fabulous review,Rita! Yes,you certainly loved this book,peppered as it was with just a little romance,with its primary focus on the central mystery! Must admit that I haven’t read any books by this author,but the fact that it combines characters from two of my favourite Austen books and enshrouds them in a mystery,compels me to download this book immediately!! Thank you for sharing your thoughts and recommendations!! Great review for a wonderful book/series! I have read all of them as I love a good mystery. And what could be better than ODC solving a mystery! Thanks Carole, apart from this one which one do you recommend? I really loved this one, so I intend on reading more of the series, I just don’t know which one to pick next. I would recommend starting with the first one, ‘Pride & Prescience’. It has a Gothic bent to it and their first foray into solving a mystery together! I read most of these before I had started reviews but enjoyed every single one! I’ve enjoyed this series for many of the same reasons. The first book was moderately good, but then I enjoyed them more with each new book. I only have the Sanditon book left. I think this one you read is my favorite. I’ve enjoyed this series for years and even got to meet the author. The Suspicion at Sanditon is my favorite and now that she’s gone through all of Austen’s major works, I hope she’ll write one with Lady Susan. Can you just imagine that? Great review. I will have to check this out. I have not read any of this author’s books. Thanks for sharing.